Whether you prefer to wear them on shirts, pants, or blazers, unique patterns are taking the world by storm. Socks aren't immune from the pattern fever, and for good reason- colorful socks add a unique punch to any outfit, from dressy suits to casual jeans. These aren't just your average printed novelty casual socks! HUSO socks feature an anatomically correct fit, seamless toe closure, elastic arch support, a deep heel pocket and key-gore seam. Each pair is packed in an individual zip-bag which is the best choice for wedding, Birthday, Halloween gift. HUSO novelty outdoor& sports socks are ideal for outdoor sports- camping, hiking, climbing, trekking, mountaineering, outdoor trail, cycling, running and so on. Clinically-tested padded sports socks, with padding uniquely designed and clinically shown to reduce pain, blisters, pressures and moisture. Precision Sewing - Precision sewing socks by hand stitching, seamless toe, deep heel cup design socks with Y-type stitching, full wrap reduce foot pressure, blister to keep your feet comfort and prevent your socks slide down into your boots or shoes. Cushion - Socks are reinforced with high-density fibers and cotton cushioning in the right area - toe and heel for added seismic performance during any outdoor activities. Arch Support - Socks have elastic arch band with compression which is benefit for strategic impact protection and avoiding foot ligament injury. Ventilation Design - Breathable mesh on the top of socks creates airflow within the fabric, an air flow that enables your skin to breathe. Superior moisture management lifts sweat from the skin for quick evaporation and resists odors, keep your feet dry and cool all the time, for health. 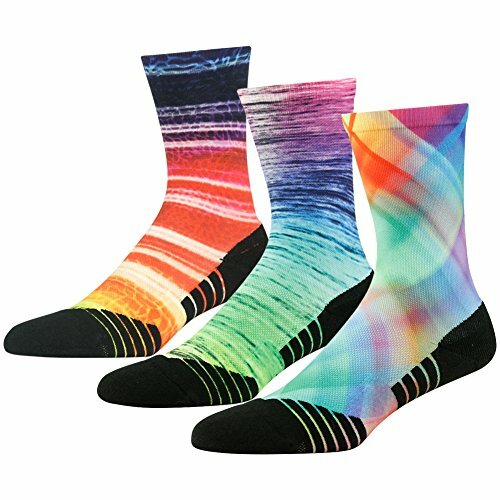 Stop Being Boring, Brighten up Your Day: HUSO Novelty Socks will allow you to be colorful, young, fashion and fun underneath the dull grey suit you are forced to wear to your adult job. Whenever you wear these you will get compliments. Moisture/ Odor Control Antimicrobial: A special mesh creates airflow to keep your feet dry and cool. Coolmax fabric wicks sweat away and resists odors. Premium Comfort Fit: Superior shape retention and a deep heel cup keeps it from sliding down into your shoes; Left&right specific design and seamless toe, perfect fit your feet. Cushioned and Arch Support: Lightly padded at the heel and toe promote comfort and eliminate abrasion and foot stress; Compression starts mid foot to support arch and plantar fascia. Size: Men's sock size: 9-13; Women's sock size: 9-11; Each pair is packed in a individual zip-bag, best choice for Birthday, Wedding, Anniversary, Back to school Gifts, for sports, workout, dress, party use. If you have any questions about this product by HUSO, contact us by completing and submitting the form below. If you are looking for a specif part number, please include it with your message.